Lorna Livey has been a professional artist for over thirty years. As a master printer at Open Studio and the Fifth Street Studio, she worked with artists from across Canada. She exhibits her work in solo and group shows and it is included in private, corporate and public collections. Born in Quebec City, she grew up in Saint John, New Brunswick and now lives in Toronto. Two Journeys is her first published work as a writer. Lorna, a gentle world traveler, is marking a milestone birthday by spending a month on her own in Bali. She intends to snorkel, make art, and reflect on her life, but finds herself instead consumed with “writing her life.” Her sharp personal stories of marriage and its dissolution, scary maddening moments as the mother of “adult children,” and dating relationships in midlife, send shivers of truth-telling recognition to women anywhere in their life's story. Life in Bali unfolds in new ways as Lorna settles in for her longest ever immersion in a new culture. Thankfully, English is spoken, but it is the unspoken that takes Lorna by surprise. Marvelous line drawings throughout remind me that all good books have pictures, and they provide thoughtful points of contemplation for the reader as well as bringing Bali to life. A very enjoyable read. I could relate to the ways you defined your womanhood and sexuality. I saw you as a woman who built her identity around the men in her life, who had the rug pulled out from under her and was forced to start anew. The trip to Bali was like a culmination of your experiences with men ending with you embracing your abilities, talents and uniqueness. I enjoyed traveling along with you in Bali and your other journey―I can certainly relate to that one. I have been there. . . a long and twisted road before finding Steve. Lorna, sixty-plus solo traveler, is off to Fiji for further adventures in snorkeling and living the simple life in a tropical climate. She is also marking the passing of her mother and escaping the aftermath of closing up her mom’s home. As she partakes of the local culture and engages with fellow travelers and her Fijian hosts, family memories come flooding in at every turn. Especially in hindsight there are some remarkable family stories, both truly funny and sad. 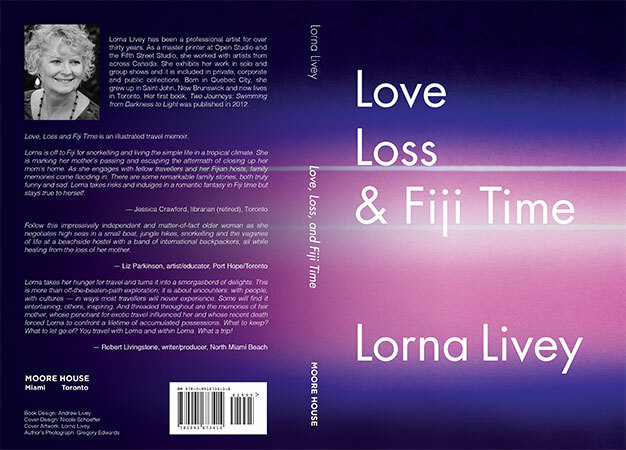 Lorna finds herself taking risks on this vacation and indulging in a romantic fantasy in Fiji time, but keeps her head about her and stays true to herself. Once again there are lovely and helpful line drawings to illustrate each chapter. In her second book, intrepid traveler Lorna Livey embarks on a solo adventure to Fiji. Follow this impressively independent and matter-of-fact older woman as she negotiates high seas in a small boat, jungle hikes, snorkeling and the vagaries of life at a beachside hostel with a band of international backpackers, all while healing from the loss of her mother. I'm amazed by the conditions you had to endure to find the peace you were looking for... it sounded like a cleansing and then being reborn to start again. A refreshingly honest and straightforward account of a South Pacific adventure and the people and places encountered. Lorna takes her hunger for travel and turns it into a smorgasbord of delights. This is more than off-the-beaten-path exploration; it is about encounters: with people, with cultures – in ways most travelers will never experience themselves. Some will find it entertaining; others will find it inspiring. And threaded throughout her travels in Fiji are the memories of her mother that keep flooding back, the mother whose penchant for exotic travel influenced her, the mother whose recent death forced Lorna to confront a lifetime of accumulated possessions. What to keep? What to let go of? You travel with Lorna and within Lorna. What a trip! Coming next―written, edited and in production: Sleeping With Rats, Travels and Encounters in Indonesia.